When the sky is dark and clear. As she purrs beneath my ear. Each page a dream, a wish. That spices up my dish. Its subtle scent so sweet. That one day we will meet. One mouth, and one nose. Touching and feeling as they work and play. Thick soft grass and very wet muddy goo. My two eyes see things wherever I turn. My two ears listen and help me learn. My mouth helps me taste and talk and sing. My wonderful nose smells everything. It would be fun to be magic, Brett thought as he snuggled into his warm bed and dreamed of dancing bears and enchanted rabbits. He and his family had just returned from a trip to the circus. They had enjoyed the funny clowns, the animal acts, and the daring acrobats, but Brett thought that the magician was the best part of the evening. He had performed exciting tricks with hoops and ropes and had even pulled a rabbit out of an empty hat. Sitting outside under the big oak tree, he began the test. He remembered Mom telling him often, “Brett, you need to put on your listening ears!” He reached into his magic kit and pulled out a sheet of pink paper and a pair of scissors. Carefully he cut out two very large ears and placed them over his own. He walked into the meadow by his house, then stopped suddenly as he began to hear wonderful things. Close by, a squirrel chattered, bees hummed, and a bird whistled a happy tune. Listening very carefully, Brett could even hear Mom singing as she worked in the kitchen. “My listening ears are magic!” Brett shouted. The grass tickled his toes like a tiny forest. The uneven ground became mountains and valleys to his bare feet. “I’m a giant!” he said with a giggle. Suddenly he felt something cool and squishy, and when he looked down, he found that he was standing in mud. Brett liked all the new feelings—especially the thick, creamy mud oozing up between his toes. “Even my feet are magic!” he decided. Sure enough, he smelled something wonderful right away and looked up to see a cherry tree covered with snow-white blossoms. A flash of silver caught his eye, and he saw a brook splashing merrily through the meadow. His big fake nose turned toward home as he smelled cookies baking—mmmm! Sprinting toward Ryan, Brett tripped and tumbled head over heels down the hill, sprawling in a heap at the bottom—and on top of his now-crumpled magic ears and smashed magic glasses. The rest of his magic kit was scattered all around him. Brett was still crying when Ryan came running up to help him. Between sobs, Brett explained about all the magical things he had discovered and how sad he was to lose them. They galloped side by side across the meadow. “Thanks, Heavenly Father! Thanks for my marvelous, magical body!” Brett shouted to the sky. Record sounds in your neighborhood, such as a dog barking, birds singing, or laughter. 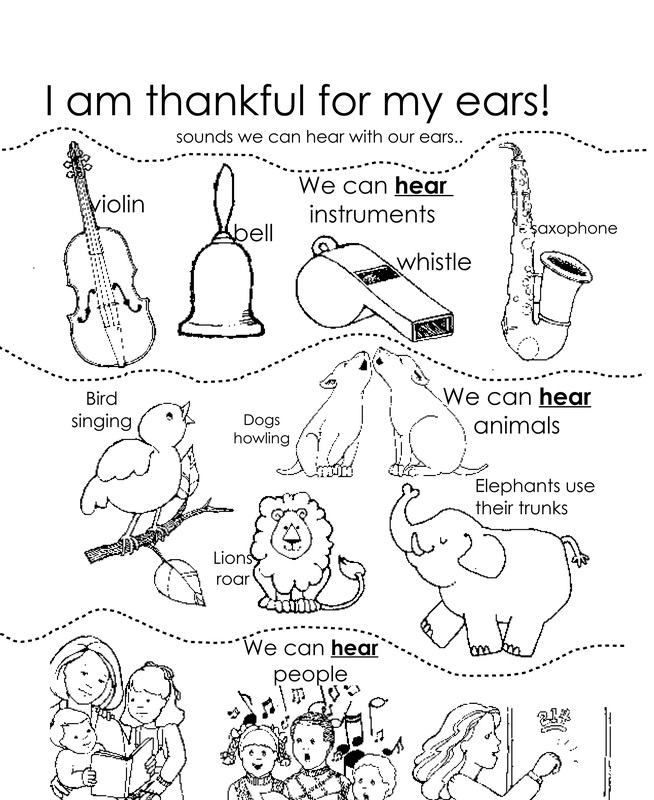 Play the sounds in class and have the children listen and guess what the sounds are. With the children, sing or say the words to verses 1 and 2 of “Thanks to Our Father” (Children’s Songbook, p. 20). For he gives us everything. Clothes to wear, and food to eat. On the left is a tempo. I set it to 100.